The Knipex 02 01 range of combination pliers have high leverage with the added eccentric joint for powerful gripping and seizing. With 50% easier cutting ability on all work applications, the 02 01 come in 180 and 200mm versions with soft cusion grip handles for added comfort and a better grip. The 02 01 series are ideal for soft, hard and even piano wire cutting. The strong durable edges will make an easy and clean cut, with long lasting results even under the toughest conditions. 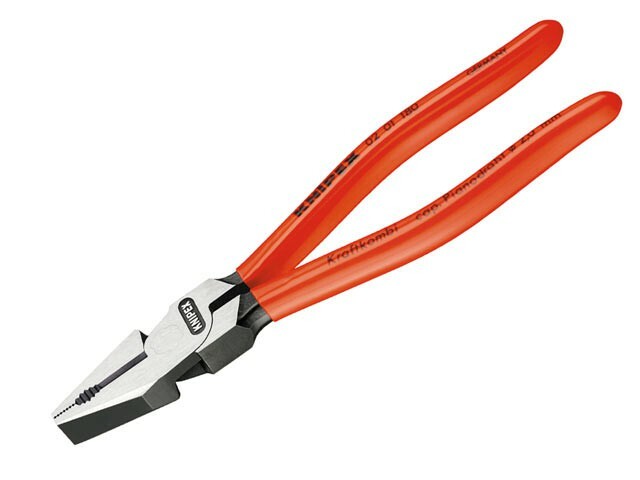 Like most the Knipex range of nippers and cutters the 02 01 range are oil hardened and tempered for longer life, with cutting edges separately induction-hardened to approx. 64hrc. 02 01 180: Piano: 2.0mm, Hard: 2.5mm. 02 01 200: Piano: 2.2mm, Hard: 2.8mm.